The applications of home designing are so varied and come with so many choices that it really makes us “spoilt for choices” sometime. From our living area to our shower room, the entire house can be filled with interiors that are both attractive and cost-effective and also comes in various kinds of designs. Apart from putting up the trendy interiors, there is one thing that should be considered by everyone to design their house; the brick slip installation. It is a kind of upgradation that your house can get that will change the entire visualization of it after the makeover. It does not depend on how big or small the size of your house is or how well built it is, you can always opt for this kind of designing as it would increase the visual outlook of your house to unimaginable extents. But one of the toughest issues that people face while they root for brick slips is to where to install them in the house? Of course, it cannot be installed in the entire household (whether it’s your new house or the one you have been living into since ages), so one must find one surface of the wall or the area near the fireplace which will enhance its outlook and provide a better viewpoint to the entire house. How to choose the correct brick slips for the walls of your house? Well, apart from choosing the wall in which you want to put the brick slips, choosing the right brick slips is also a tough task. The most convincing way to choose the right combination of brick slip and the wall is to find that corner of the house where you spend most of your time. Also, you can put up the brick slips in the walls which are visible more to the visitors, like the wall in your living room. Now, about the designs, the brick slips normally do not come with varied designs but the Handmade Brick Slips shell out a vibe of sophistication when you put them up in your wall. People blindly choose the fireplace area or the internal chimney walls for placing the brick slips; it is a common choice and thus the design and color combination of the brick slips for the walls must be dark and extensive to match the burning effects of the fireplace. You can also do one more thing to find the suitable match of brick slips for your walls- you can order for sample showings before you actually zero-in on a design. In most of the cases, the brick slip cladding contractor provides all kinds of samples that they have on offer for different kind of walls which they provide to the customers on request by them. When you put a variety of design on the wall together, you can choose which one is looking better and thereby select that one for a distinctive outlook of the wall. 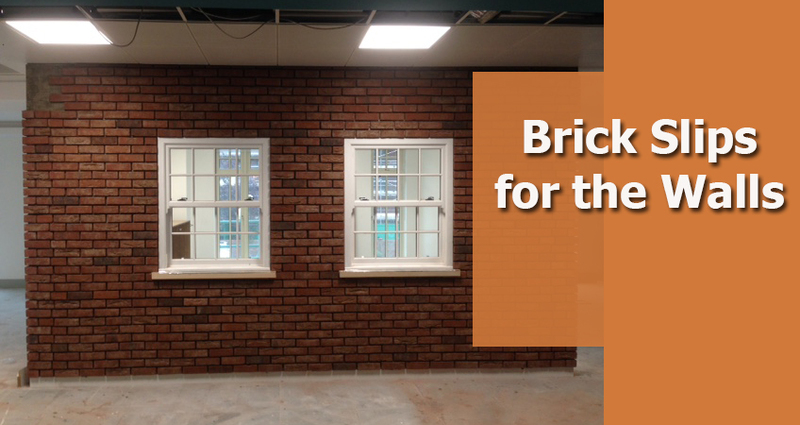 How to install the brick slips- A brief description! Obviously, the professionals possess expertise in installing the brick slips but for the general knowledge of the ones who don’t know much about the procedure, this brief discussion might help. The primary processing of the brick slip cladding is to measure up the walls that are to be cladded by the slips. Then you need to select the adhesive that would stick the slip tightly to the wall. After that, do the surface preparation, keying it, priming it, and therefore the application of the brick slips is carried out to provide a distinctive feature wall. This application involves a detailed process which is carried out by the experts according to their own ways. We all want our place of residence to be attractive through any and every means possible. We hire experienced professionals for doing up our interiors and exteriors as well. We spend so many bucks for just enhancing the beauty of our abode which we lie to call “home sweet home”. That is why choosing the right kind of designing ideas while you plan a makeover for your house is something that the wise people do. And the brick slips are really a good way to up the visible approach of your house by a notch higher. But when you do so, make sure you also look after the corners of the wall as they create the most embarrassing outlook if not taken care of properly. When you use the brick slip installers, try to cover the corners as well because leaving them bare and covering the entire wall with the slips won’t make it look good at all. So, the next time you think of designing your house, consider the brick slips in creating distinctive wall features.